However, these markers of success must not lead to complacency. There are black spots on this record, including the performance of younger workers, the relatively poor performance of rural areas and smaller urban areas, and the endurance of atypical work. With a tight labour market now is the time to address these areas of concern. And of course, the employment boom has occurred alongside (indeed, likely partly in response to) the extremely poor performance of pay and productivity in recent years. 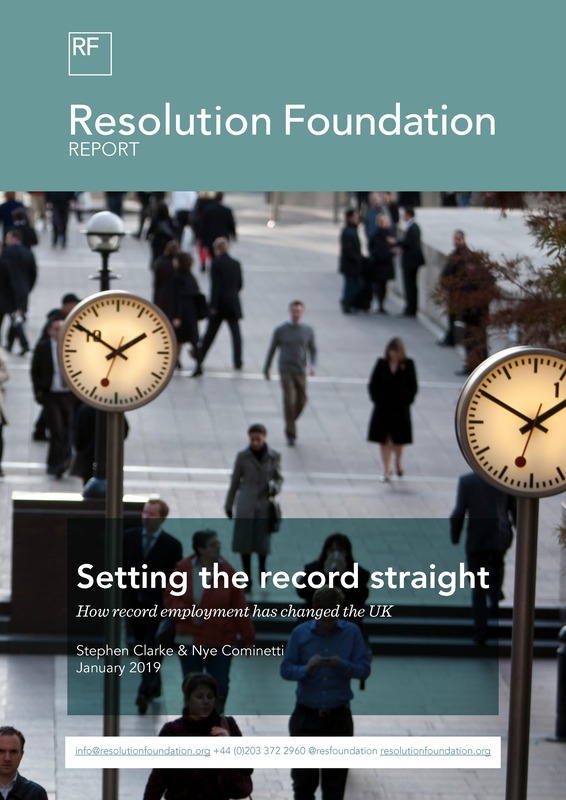 These issues both explain why the UK’s jobs boom does not receive the universal welcome we might expect, and represent the key challenges to ensure that the labour market continues to contribute to rising living standards in the years ahead. First, is the employment boom all about migrant labour? No, immigrants have been some of the main beneficiaries, but not at the expense of native workers. Migrants have accounted for two-thirds of the increase in employment since 2008 (in part because they have grown as a share of the population), but in the same period the employment rate for people born in the UK has risen by over two percentage points to a record high of 75.8 per cent. Second, has jobs growth been London-centric? No, rising employment has been driven by relatively low-employment parts of the country catching up. The story of the last decade is that of lower-employment urban Britain catching up with the rest of the country, while low-employment rural areas have done less well. Where the capital is distinct is in population growth. It is for this reason that London accounts for around a third of the net employment increase since 2008. It is the size and expansion of the capital, not its labour market performance, which stands out. Third, is employment growth only in low-paid roles? No, the recent decade has been one of occupational upgrading, but there are worrying trends for younger workers and pay performance has been poor across the occupation scale. Between 2001 and 2018, occupations that started out in the bottom three deciles of the earnings distribution have declined as a share of employment while those in the top three have increased (by 80 per cent). Fourth, has the increase in job quantity come at the cost of job quality? The answer is ‘yes’, particularly in the jobs boom’s initial phase. Two-thirds of the growth in employment since 2008 has been in ‘atypical’ roles such as self-employment, zero-hours contracts or agency work. Since 2016, however, atypical work has plateaued as the labour market has tightened and full-time work has grown.